A Parkinson Family ~ How well are we supporting each other? As a child, in my home, there was a particular saying that my siblings and I were taught from a very young age. We knew where it came from, and we knew its importance. Now as a mother, I have taught the saying and the urgency of it to my own children. In 1843, the first major wagon train to the northwest departed from Missouri, on the Oregon Trail. Over the next century, thousands more would do the same. The wagons were typically covered, pulled by oxen or horses and held all of people’s worldly possessions. When it started getting late in the day, the wagon master would send instructions down the line to “circle the wagons”. 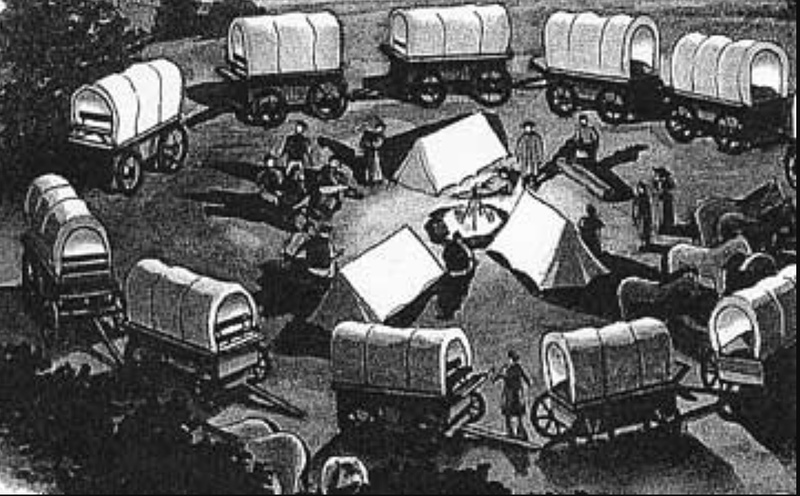 This call was to signal the travelers to move their wagons into a large circle and it was inside this circle that the families spent the night. During times of danger, this afforded them protection from attacks that came from outside the circle and allowed them their best chance of protecting those things which they held most dear. I remember times when my parents would call us together as a family and say “It’s time to circle the wagons”. We instantly knew what that meant, as my own children do now. It meant that someone in our family needed saving. That one of us was in danger, scared, hurt, struggling, or simply feeling alone and friendless. The call to “Circle the wagons” is a call to each family member to come to the aid of that person. To stop thinking about ourselves and our own needs and join together as a group, surrounding what is most precious, and take care of each other. Very recently I found cause to “circle the wagons” in my own family on behalf of a sweet daughter, and as I did so it brought to mind my other family, my Parkinson family, and I found myself wondering, do we need to “circle the wagons”? My answer is yes, I believe we do. We all have our good days and bad days. We have happy days and lonely days. Doesn’t each one of us feel at some point that we are being attacked and need a circle of love and support surrounding us? How can we help each other? If we are having a good day can we take a meal to a friend who is struggling? Can we make a phone call just to tell someone we are thinking of them? Can we drop off a book? Give a compliment? Write a letter? Invite someone for a walk or to support group meeting? I invite you to think of ways in which people within our Parkinson community can “circle the wagons”? I like to think of the quote by Vera Nazarian “Was it you or I who stumbled first? It does not matter. The one of us who finds the strength to get up first must help the other”. I invite each of you to help each other, support each other, find each other, and mostly, love each other. “Circle the Wagons” and we can through this together. Thank you so much for your desire to help.I am truly touched. Is it making a difference in the lives of those with PD that you would like to help? Are you wishing to donate time to your local society or to give financial support. Or even spreading awareness by sharing my blog with your FB friends. I would love to support you in finding a way to help!Be in touch! Bless your heart and have a wonderful day.